Neville Morley speaks on the EU and the classical. 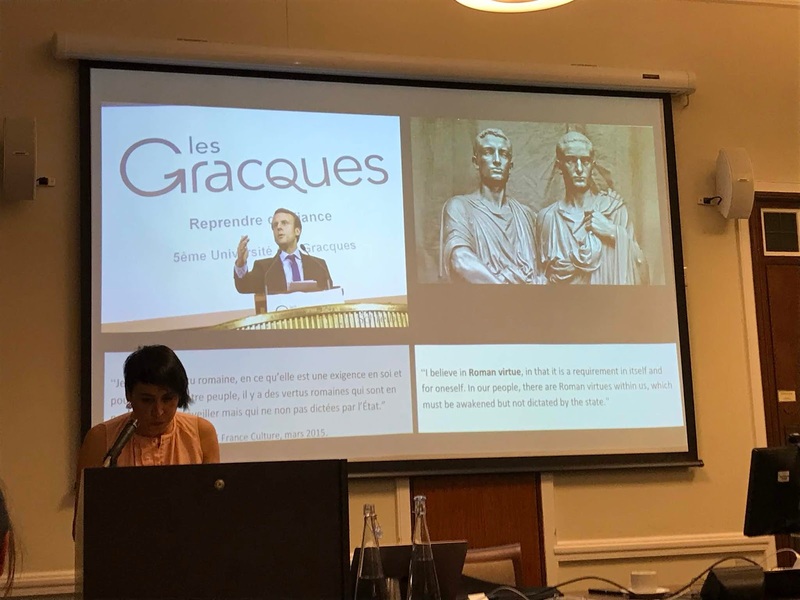 Last week, I participated in a workshop in London at the Institute for Classical Studies in London called 'Claiming the Classical' with a wonderful and impressive group of students and scholars working to understand how the idea of the 'classical' manifests in 21st century politics. The organizers were Naoise Mac Sweeney and Helen Roche. The idea behind the workshop was a first step in creating a 'international network of academics, researchers and other interested parties. Together, we work to examine the use of classical antiquity in twenty-first century politics." This first of hopefully many meetings and discussions tried to map many of these 21st century political uses. This blog is a reflection on what I took away from it. So, what is 'the classical' and how do people claim it? Put 'the classical' into google and the top choice for completion is 'the classical world.' Typically the 'classical' encompasses the literature, arts, and history of ancient Greece and Rome, but limited to the years between 8th c BCE and the 4th century CE. Give or take a century or two or four on one end or the other. We identify 'the classical' with specific styles of art and architecture, literary forms, genres, with references to specific authors., with specific clothing and weaponry--things that look like a stereotypical "Greek" or 'Roman" thing, like the columns shown above, or togas, or a pegasus. 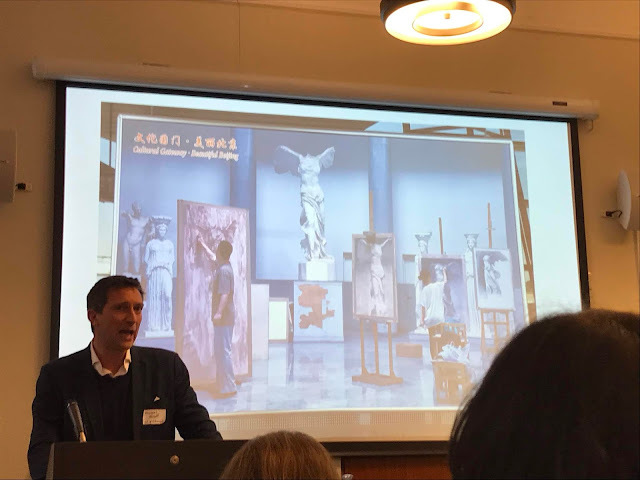 or the sculpture casts shown here in a photo from the Beijing airport shared by Dr. Michael Scott (University of Warwick) at the 'Claiming the Classical' workshop. 'The classical' typically excludes the 'eastern' Asian and North African neighbors of Greece and Italy--its one of the things that makes the China example above so intriguing: who is the intended audience for this image? Why show Chinese art students copying the classical casts? Should we see these artists surpassing or assimilating 'the classical' through their own engagement? It's hard to say. In Turkey, a land with far more direct claims to the classical than the United States or northern Europeans, we saw the classical being claimed only as a commodity--the Greek, Roman, and Byzantine pasts of Anatolia marketed to 'westerners' who seem to think Turkey's rich archaeological sites are of value. 'The classical' also typically excludes the northern European neighbors of ancient Greece and Rome, except when they wrote in Greek or Latin, or, more importantly for this post, when those northern Europeans were 18th-21st century British, German, or French scholars, artists, and governments, whose claims to be the inheritors of 'the classical' formed part of their national identities at one time or another in their history. These claims by the British and the Germans especially have embedded the classical into the psyches of the nation so that the Parthenon marbles are thought by some to belong more to the British people than modern Greeks. Anne-Sophie Noel (École Normale Supérieure de Lyon) discusses French President Emmanuel Macron's relationship to the classical. Interestingly, claims upon the classical seem to coincide with the rise of the nation state in Europe, functioning as a heritage for may different groups of Europeans--not only Greeks and Italians. Somehow, peoples whom Herodotus and Eratosthenes placed at the far edges of the world, whom they hardly knew anything about, decided that they were the true inheritors of this classical Greek past. More so than their contemporary Greeks, whom they considered unworthy of their own past. Something still active and part of the reason, something Konstantinos Poulis (ThePressProject) discussed at the workshop in connection with the debt crisis and the rise of Golden Dawn. 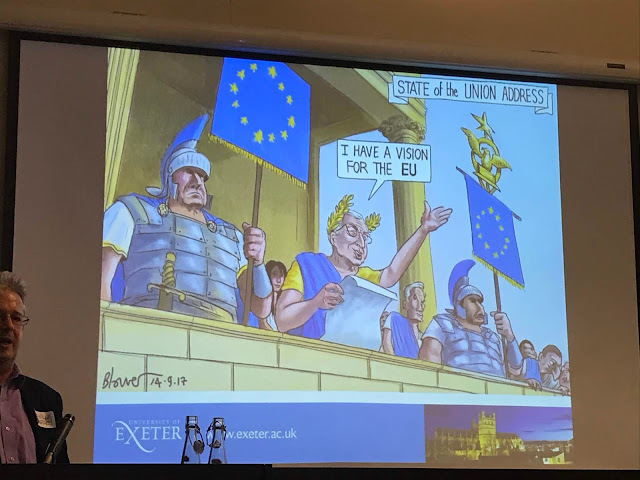 Damjan Krsmanovic (University of Leicester) discusses Brexit through the lens of Boris Johnson, known for his claiming of the classical. The use of phrases like 'Mare Nostrum' and 'Mos Maiorum' to name policies towards refugees also has a history of imperialist claims to not only the space of the Mediterranean, but the past and future of it as well, as Sam Agbamu discussed. I also recommend this post by Ida Danewid "White Innocence in the Black Mediterranean" at The Disorder of Things blog (I plan on getting her article on the topic when I'm back in the office with access). 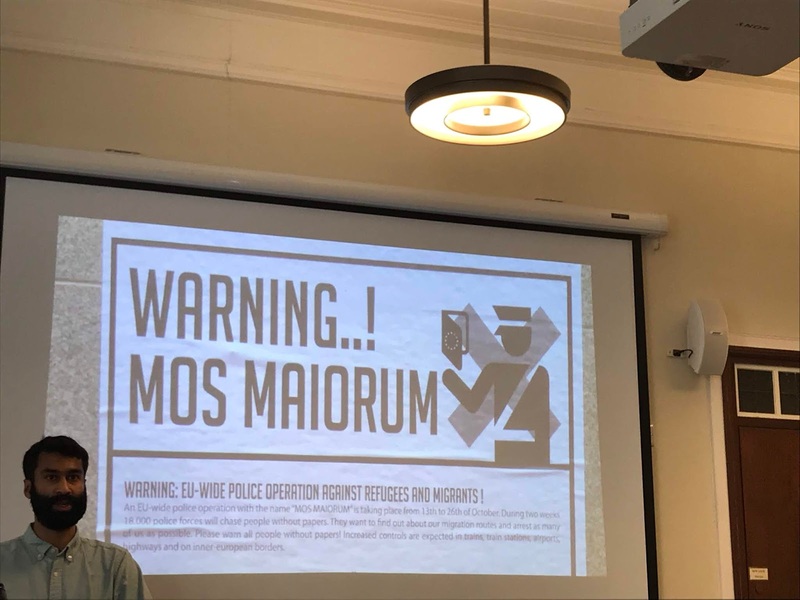 Sam Agbamu (King's College London) on 'Mare Nostrum' and 'Mos Maiorum' as refugee policies. 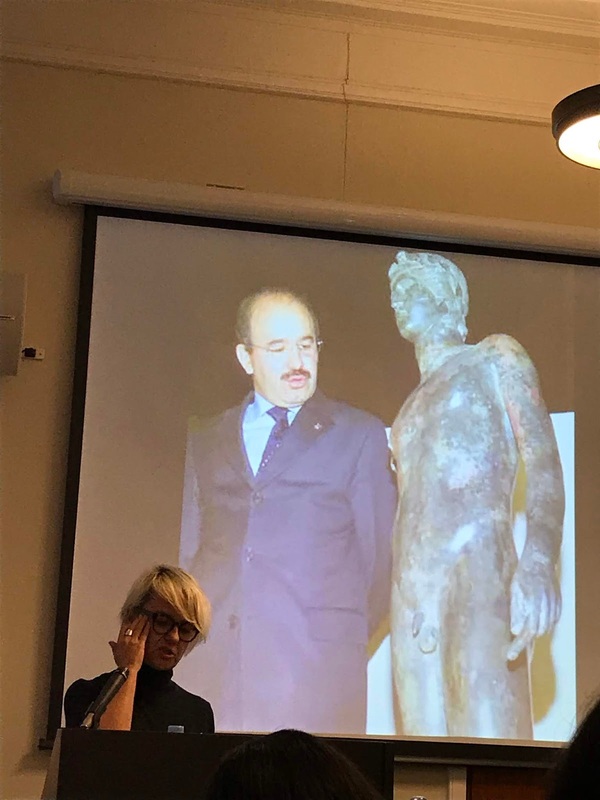 The German claims have led to such excesses as the perpetuation of the myth of an Aryan/German invasion and to the Nazi ideal in the ancient Greek sculptural body. The claims of the British rested both on the traces of Roman Britain in their own land and on the British Empire's right of conquest; they viewed themselves as the true intellectual heirs of Plato and Cicero and their power in the world reflected this. The Nazis simply recreated the ancient past to make themselves the genetic descendants of the ancient Greeks. 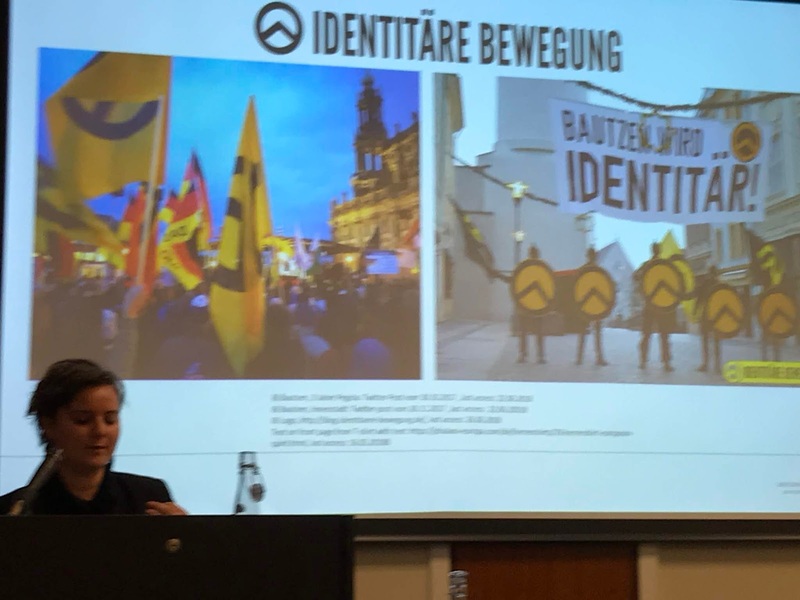 Julia Müller (Technische Universität Dresden) discussing identitarian movements in Germany. Their online shop is particularly interesting and features t-shirts invoking Thermopylae. Americans of European descent also have at times over the last few centuries laid claim to the classical as well based on their connections to those Europeans who also claimed the classical. The Founding Fathers looked to classical models to help create our Constitution and to justify our most loathsome institution -- slavery. Consistently since the founding of our country, the classical has been claimed in defence of the continued perpetuation of racial hate and institutionalized racism, of white supremacy and white nationalism, of colonialism and imperialism-- whether it is architecture and art, 'blood and soil' heritage, or some sense of a 'western destiny'. Even those who disavow racism often hold up the decidedly racist and misogynist Athenian democracy, idealized as some sort of golden age, ignoring its exclusions and foundation on slavery (discussed by myself, Denise McCoskey, Curtis Dozier, Liz Sawyer, and Chiara Bonacchi). 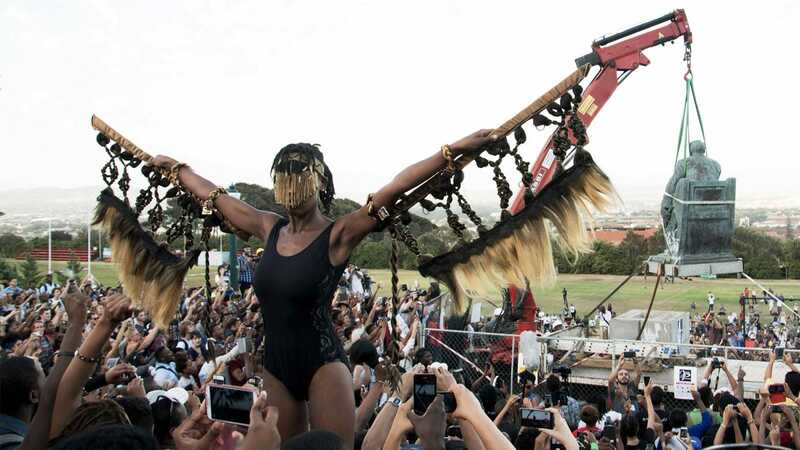 Grant Parker (Stanford University) discussed performance artist Sethembile Msezane's anti-classical 'Zimbabwe Bird' during the Rhodes Must Fall protests in South Africa in 2015. Nandipha Mntambo's 'Europa', also from Grant Parker's discussion. But claims on it can also be seen as respurposing or appropriating the classical despite the colonizer, or, perhaps, to reclaim a part of the classical from the colonizer. The legacy of classics as a tool for empire is continually being debated, hidden, ignored, studied, and praised--depending on whom you discuss it with. And the question of why anyone wants to claim the classical is bound up to that history. The history of the classical in the modern world is a history of a field created as a tool of racism, of empire, of classism, of misogyny. And yet, we see broad claims made upon the classical that reject, or at least, refuse these connections. 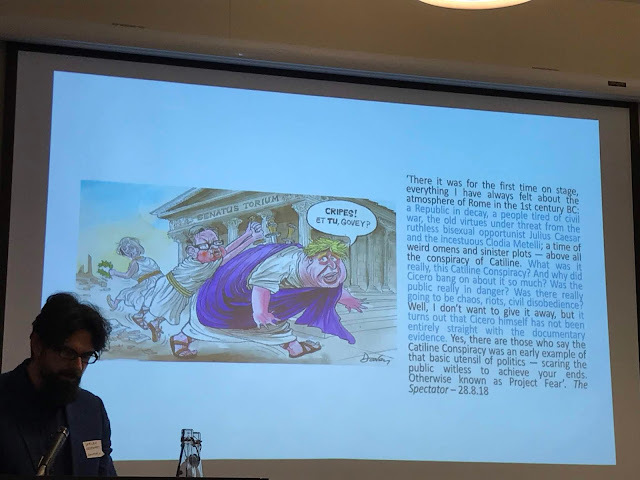 From China to South Africa to Ghana and Brazil, the workshop highlighted not only the far right 'appropriations' that seems to have awakened classicists to our perils, but also artistic and literary uses of the classical that offer new ways to think about what the classical is and can be. Because of its history, however, any claims upon the classical will almost always be political--even when they aren't. One question that kept returning at the workshop that we never had a good answer for was why peoples and groups claim the classical. Some suggested it was prestige--that classics has been granted historically a place of privilege in many places and so an appeal to the classical is one that seeks to participate in that prestige. I wonder, however, if it isn't the problem of universalism--for centuries European powers have sought to center the classical as a universal value. Why read tragedy? Because it reflects universal emotions. Why read Thucydides? Because he gave us a vision of a shining city on a hill that had a democracy and democracy is, of course, the telos of all political systems, right? I think it's something else--because empire conditioned the world to believe that the classical was the only truly universal culture and so everyone should want to claim it. The study of classics isn't restricted anymore in theory to only the elite of northern Europe and the US. Women and people of color are no longer [explicitly] rejected from its ranks as incapable of learning Greek or understanding Cicero and Vergil, but this isn't necessarily the reality of classics as a field. The classical has a place in public discourses throughout the world--sometimes because of colonialism, sometimes despite it. And yet, I left the workshop thinking about the Classics for All ideas, our [feeble] attempts to make a more inclusive classics--attempts that refuse to make space for the varieties of classics that exist both in the academy and without. We are still a restrictive field that relies on knowledge of two languages--Ancient Greek and Latin--to act as gatekeeper to legitimacy as an arbiter of the classical. There are many ways to claim the classical. For too long, we academic classicists have kept ourselves away from the public discourse and, too often, assumed that any classical receptions, references, or claims by national governments, political and social institutions, or movements was a clear good, or at least harmless, so long as it meant that the classical still had a place in our public discourse and we could use it to demonstrate the relevance of our field--as when today (Sat Nov 17) the SCS social media accounts shared an op-ed by Bret Stephens seemingly simply because it contained the word "Plato" in its title. He's not viewed as a friend, ally, or even neutral party by many PoC and women. And even when one's Twitter page says "retweet =/= endorsement", when that retweeter is one's professional organization, it sure can feel like an endorsement. Not all claims are equal and many a political claims to the classical is done in the name of racism, misogyny, homophobia, and a myriad of other types of prejudices. When we share those receptions, those 'fun' or 'insightful' articles that seem innocent enough, but are written by those who peddle in discrimination and prejudice, we link ourselves with their politics whether we mean to our not. By doing so, we send a message about who is and isn't welcome. We limit the scope of who we think can and should lay claim to the classical. Afraid to alienate our traditional base of conservative 'white' men, we continue to alienate most everyone else even as we position ourselves as fighters against white supremacist claims to the classical. We as professional classicists are (maybe too late) taking up the task of engaging these more nefarious claims on the classical. But this isn't the only reflection we need to do. We must also look at how we have failed in the past to be self-critical in our own claims and practices around the classical. As Denise McCoskey has recently written (and which has been on the minds of many of us who became classicists in the shadow of Black Athena) classics as a field is paying in the 21st century for our failures to come to terms with the origins of the field and its continuing problematics in the 20th century. We can't only look to the far right, to the fascist and white nationalist claims and try to 'reclaim' those 'appropriations'. We also need to do some soul searching about how we keep our field tied to those structures of racism, classism, and misogyny that were its roots by binding ourselves to notions like 'western civilization' and whiteness and exclusivity. Studying classics shouldn't be about joining an elite club, and yet that is often how we sell it, how we view it, and how we seem to want to keep it--even despite ourselves. What I took away from this workshop was that we have a lot of work to do.